We are a religious community grounded on the principles of Unitarian Universalism that embrace the diversity of religious beliefs. We are a religion of deeds, not creeds. As members and friends of NWUUC we affirm this covenant, grounded in our Seven Principles, as a statement of how we as a congregation intend to work with each other to create a vibrant, caring community. Speak our opinions and our feelings with care and compassion. Seek to understand others’ truths by listening actively and respectfully. Keep talking, directly with the parties involved, to resolve conflict or concerns. Hold ourselves accountable for our words and actions. Rev. Jonathan Rogers is filling the Northwest pulpit as interim minister following the departure in December 2017 of Rev. Terry Davis. Rev. Rogers will serve as interim minister for 18 months, after which Northwest expects to have a new called minister. Rev. Jonathan Rogers is originally from Central Maine. He grew up attending the Waterville Universalist Unitarian Church. Jonathan has a Bachelor of Arts degree from Brown University and an Master of Divinity degree from Harvard Divinity School. His sources of received spiritual wisdom include Buddhism, Integralism, and process theology. Rev. Rogers most recently served the Unitarian Universalist Congregation of Atlanta (UUCA). He joined the UUCA staff in 2015 initially as Youth Programs Coordinator and later as Associate Minister. Prior to joining UUCA, he served Unitarian Universalist, Quaker, United Church of Christ and Renewal Jewish faith communities in many roles for over a decade. Jonathan is married to Annie Massart. Jonathan and Annie reside in Decatur, Georgia with their three dogs, Tony, Grover, and Pickles. In 2013, Northwest commissioned Rev. Joan Armstrong-Davis as Community Minister. Joan is an ordained Unitarian Universalist minister with 30 years of experience as a parish-based pastor, educator and counselor. A 1989 graduate of Emory University’s Candler School of Theology, she finished her residency in pastoral care at Emory University Hospital in 2003 and has also done post-graduate work in conflict resolution, mediation and trauma intervention and prevention. In collaboration with Rev. Rogers, Rev. Armstrong Davis is involved with NWUUC’s pastoral care team in providing support, co-facilitation and professional backup. She also has a standing invitation to preach at NWUUC at least once per congregational year. She may officiate at member weddings and other rites of passage at Rev. Roger’s request. Christina has a strong background working with non-profit organizations in Houston, Texas including the Linda and Jerry Strickland Family Foundation, Urban Harvest, Catering for Kids, Hospice Care, and Planned Parenthood. She has extensive Unitarian Universalist religious education experience working as an advisor and staff at the Summer Institute YRUU, SWUUSI, and SEUUSI programs. She was the Director of Youth Programs at the La Foret Summer Institute in Colorado for two summers. She has coordinated and led intergenerational events including as OWL co-facilitator, RE committee member, Coming of Age mentor, and RE class leader. Philip J. Rogers earned the Bachelor degree in Music Education from Kentucky State University. At the University of Illinois he earned the Master of Music degree in Choral Conducting and the Doctor of Musical Arts degree in Vocal Performance where he studied voice with Professor William Miller whose technique of “singing nature’s way” fashioned an understanding of the natural beauty and effectiveness of the individual voice. Dr. Rogers served as Director of Choral Activities at Shortridge High School in Indianapolis, Indiana; Graduate Assistant conductor of the University Black Chorus at the University of Illinois; Choral/Vocal & Music Appreciation professor at Parkland College in Champaign, Illinois; Adjunct Voice Professor at Spelman College of Atlanta; Voice instructor in the Preparatory Music Program of Clayton State University, Morrow, Georgia; Adjunct professor at Oglethorpe University of Brookhaven, Georgia; and maintains a vocal instruction studio in Decatur and Sandy Springs, Georgia. Based on a long range plan by the Unitarian Universalist Congregation of Atlanta, Northwest evolved from a third UUCA Sunday service to a fully established congregation in the greater Atlanta area. 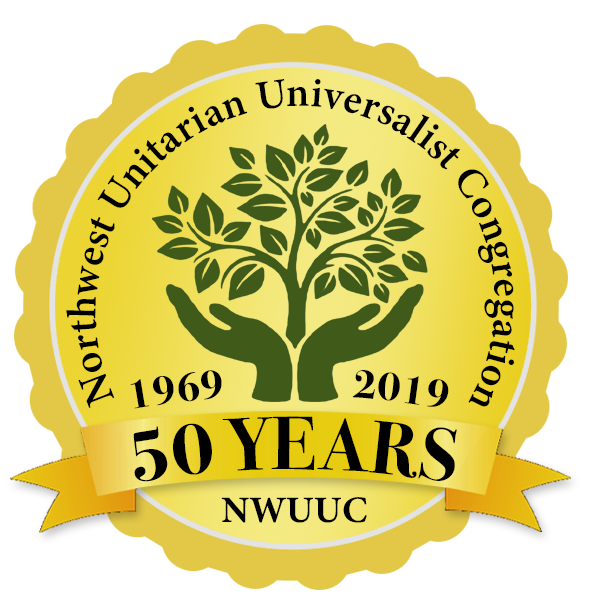 The Northwest Unitarian Universalist Congregation was formally established in June 1969. The new congregation initially held services in the Liberty Guinn School in Sandy Springs and later at Sandy Springs Middle School. A five-acre wooded lot was purchased on Mt. Vernon Highway in 1971 to be the permanent home for Northwest.